As long as oil is transported by sea, accidental spills will remain a threat to the marine environment. When an oil spill occurs, the cleanup response must be quick in order to minimize the environmental and economic impact. To help speed up the response, researchers at Osaka University are developing an autonomous marine robot that can track down spilled oil and provide real-time location data. SOTAB 1 (Spilled Oil Tracking Autonomous Buoy 1) is a 110-kilogram (243 lb.) GPS-equipped robot that measures 2.72 meters (9 ft.) from top to bottom and 27 centimeters (11 in.) in diameter. 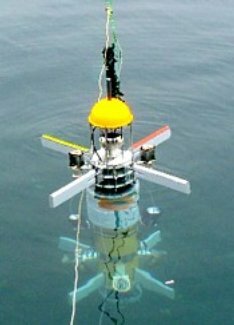 It has imaging sensors that can spot floating globs of oil from a distance, as well as viscosity sensors that detect the presence of oil, and it includes a wind monitor, depth meter and water thermometer. When multiple robots are dropped into the water at regular intervals around an oil spill, they can provide a wealth of valuable data to cleanup crews and allow them to monitor a wide area. Once in the water, SOTAB 1 begins searching for oil by reducing its buoyancy and diving underwater, where it trains its imaging sensors back up at the surface. When the robot sees something that looks like oil, it readjusts its buoyancy and floats back to the surface, using 4 fins to steer toward the oil slick. It then takes water samples and determines how much oil is present. As SOTAB 1 follows the oil around, it sends back real-time data about its location and the surrounding meteorological and oceanographic conditions. Head researcher Naomi Kato, an underwater robotics engineering professor at Osaka University, says SOTAB 1 is still in the development phase, but he hopes to see it become commercially available in 2 to 3 years. "We want to get the weight under 30 kilograms and extend the battery life to about 3 to 4 weeks," says Kato, who began working on the robot in 2006. "We would one day like to see these robots become standard equipment on oil tankers."